Google Maps Now Shows If Parking is Available - Something New Everyday! 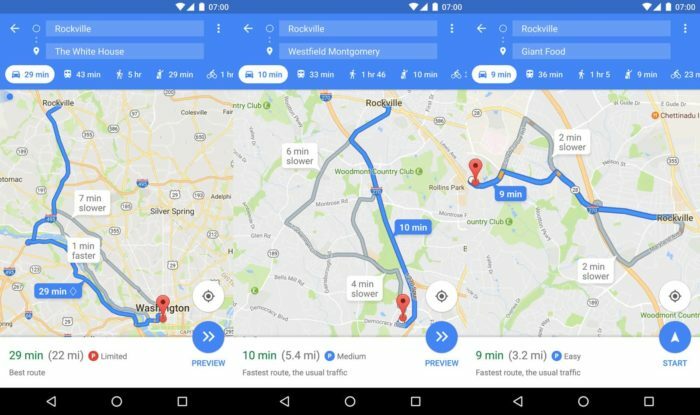 Google Maps already shows you much traffic there is on the way to your destination and therefore what is the best possible route to choose. It can also give you a pretty accurate estimated time of arrival, which can be really helpful at times. However, what you never anticipate is whether or not you will be able to find parking when you reach your destination. Thankfully, in a Google Maps update v9.44 beta, you will now be able to see the parking difficulty at your destination. It is actually color-coded so when the parking is “limited”, the icon will show up in a red color. The “easy” and “medium” will show up as a blue icon. Once you start driving around, it gives you further details, indicating that parking around your destination is “usually not easy” or “limited”. The parking availability isn’t actually shown in real-time but instead gives you the information based on the usual conditions that you would expect to find at your destination. It doesn’t even lead you into the parking space but at the very least, it gives you enough information for you to decide whether you want to take the chance to try and find parking over there or not. The new parking indicator is still rolling out to a some users who are on the Maps beta. If you are already a beta tester, you can download the app straight away and test it out. In case you are not, you can register as a tester over here. Or you can just download the APK from here and install it right away. As mentioned before, the feature is gradually rolling out so it might be possible for you to not see it right away. Availability in Pakistan will also be limited and so far no parking spots are showing up. Continue watching this space for more updates.